Once you have received your Aurora Suite serial number you need to enter it in order to activate Aurora Suite for full operation. Serial numbers for Aurora Suite are 12 digits, like 0000-0000-0000. 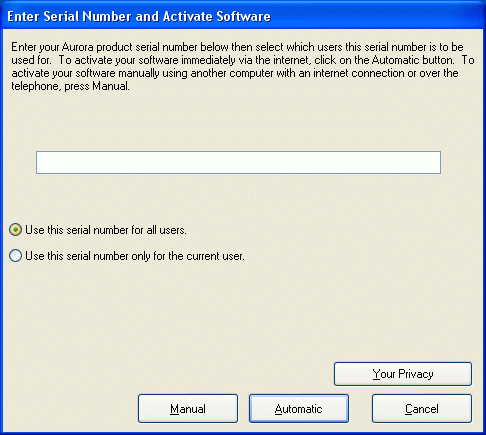 The simplified serial numbers in Aurora Suite are much easier to enter than our previous products. 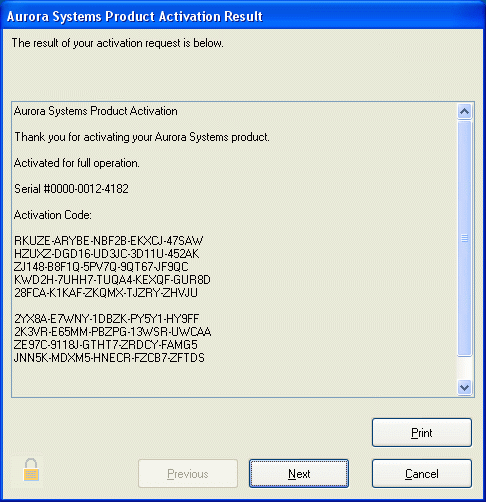 Aurora Activation sends your serial number along with a special Hardware Code unique to your computer to Aurora Systems servers which provide an Activation Code which enables the software for full operation. You can learn more about activation from our online Activation FAQ. Please Note: your Aurora Suite serial number is your key to access the software and services you have purchased from Aurora Systems. Aurora Systems is a small company and we rely on the support of customers like you to continue in our mission to produce affordable, effective solutions for people with special needs. Please do not share your serial number with others and be sure to protect it like your Social Security Number (SSN), Social Insurance Number (SIN) or other confidential personal information. Enter the serial number you have been provided. If you have purchased Aurora Suite through its Buy Now feature, this should be filled in automatically for you. Most users will select Use this serial number for all users so that any subsequent Windows users added to the system will be able to use this serial number. Tip: Network administrators should select to use the serial number for all users so that Aurora Suite will work for roaming users. If only a single Windows user will be using the software, or if different users are using unique installations of Aurora Suite, choose Use this serial number only for the current user. If your computer is connected to the internet, press Automatic to connect to Aurora Systems servers and activate your software automatically. If the Activation process is successful, you will be provided with an Activation Code as shown above. If you prefer, you can use this code in the future to activate manually provided your computer has not changed. If you do not have access to the internet on the computer you are installing Aurora Suite onto, you can also activate the software for full operation manually. Choose Manual to start manual activation and to view detailed instructions on Manual Activation. Copyright (C) 2006 Aurora Systems, Inc. All Rights Reserved.